Anyone that has seen an Odachi sword close up will understand that they are very formidable weapon. Being a large two-handed sword that could be wielded with devastating impact, there is something truly awesome about the reality that warriors once used them in battle. This of course has made the Odachi sword a popular reproduction purchase. But if you’re looking for odachi for sale, who do you buy from? 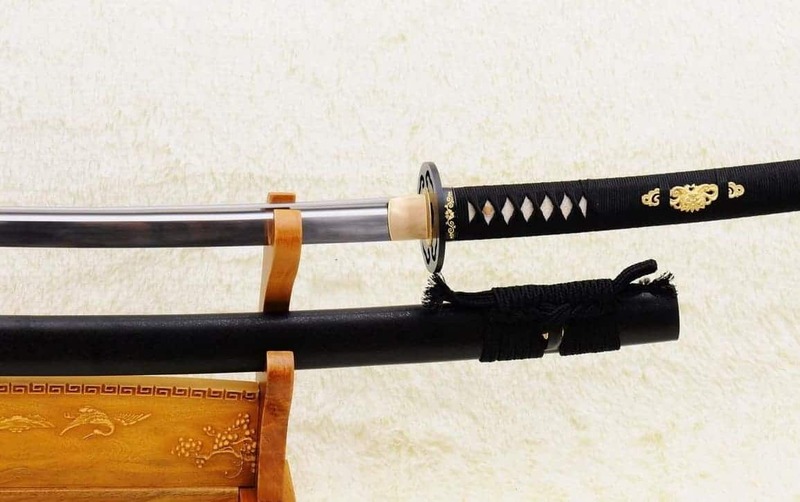 What types of odachi are available and how much should you pay? We will take a look at all of that and more today. 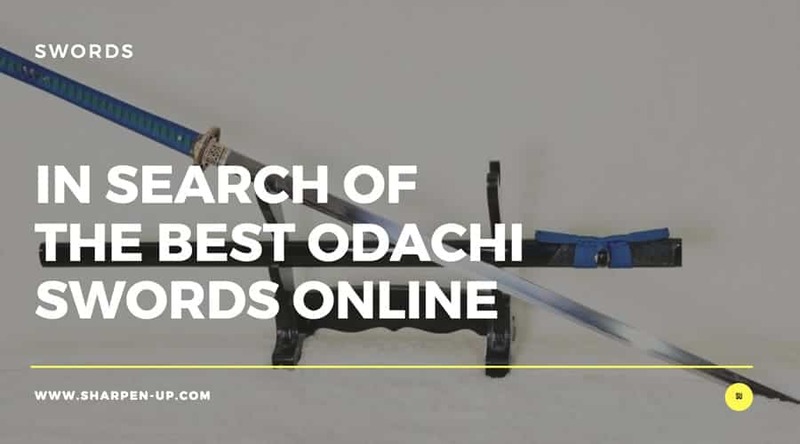 We have brought together 3 of the best odachi swords currently available online, with full reviews and a dedicated buyer’s guide. The direct translation of “Odachi” from Japanese into English is ‘big thick sword’. The word Odachi is sometimes confused with Nodachi, the latter meaning ‘field sword’. However, with the many reproduction swords now available, the two types have become quite interchangeable. What is quite interesting is that fact the Japanese characters for “DA” and “CHI” are the same as “TACHI”. This is directly related to an older style of sword that was used before the advent of the katana sword. Experts suggest that the Odachi was first used in the 5th Century. The evidence for this is the fact a 117.0 cm sword was discovered buried in a mound in Kumamoto. Research dated that sword to the 5th century and the dimensions fit that of the Odachi sword. An even larger sword of 137.9 cm sword was unearthed from a mound in Tochigi. This too was dated to the 5th Century. Such are there size, some of these discoveries were once thought to be used by the Gods of Japanese mythology. For instance there is a sword called the “Hutsunomi-tamano-tsurugi”. This sword was given to each reigning emperor in ancient Japan. 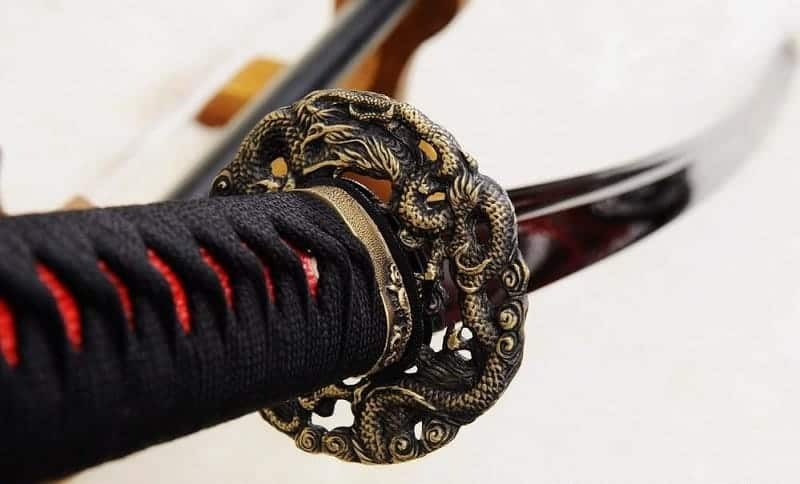 However, modern scientific analysis has shown that the sword was made during the Heian era and is merely an imitation piece, based on the sword used in mythology. The fact that the odachi sword is attributed as being a weapon of the Gods does give an indication of just how grand they are. Buy one of these and you will have the ultimate show piece. Because of their size, a quality reproduction odachi is difficult to produce. This means there are a few things to consider when looking for the best odachi for sale. It may sound like an obvious point to make, but you should ensure the manufacturers of the sword you buy have the required skill to do so. This can be ascertained by the companies reputation and hunting for reviews such as the ones below. 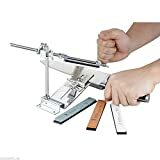 You should also look into what processes the craftsman use. Do the follow traditional Japanese forging techniques? Are the swords made to order? Because of the size of the sword, a great deal of skill is required in the quenching and tempering when it comes to the odachi. Special facilities are also required that are related purely for the construction of odachi, (for instance the quenching tanks have to be larger). Your chosen manufacturer should have all the skills and equipment to make the ultimate odachi for you. High carbon steel is the preferred choice for affordable yet quality odachi swords. You need to remember that a lot of steel is needed to produce an odachi. This should have impurities removed, and if possible be folded steel in order to have sufficient strength. 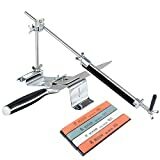 Technique is also significant here, as the large surface area of steel needs to be hammered quickly and in a uniform manner for you to end up with a truly beautiful display piece. 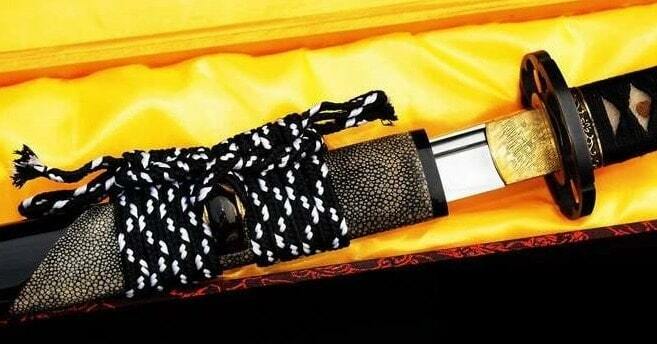 Believe it not a true odachi is so large it has to be polished in a special manner. Not even the best sharpening practitioners can hold the sword and move it across a polishing stone and expect good results. Odachi should be hung from special mounts or at the very least suspended in a position so that the sharpener can be moved across the sword. This means you want the sword to be hand polished by the manufacturers before it leaves the workshop and reaches your door. 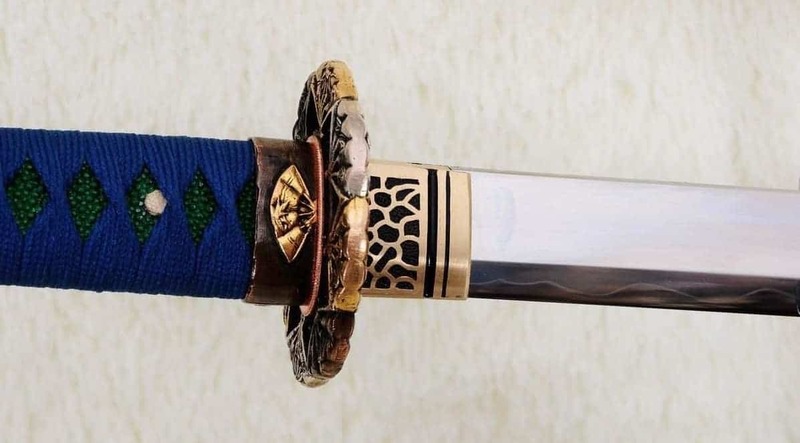 Other extras to look out for when buying the best odachhi sword include the quality of the sageo/ito, (this should always be silk, anything less and you forget it), a genuine same’ (rayskin) and the types of fixtures and fittings. It’s all very well owning a quality odachi, but if the various paraphernalia that comes with the sword is not up to scratch, your display piece will not create the impact you should be striving for. For our review section we have chosen 3 of what we believe to be the best odachi swords you can curretly order online. They cover a range of price points, however each is hand forged using traditional techniques. 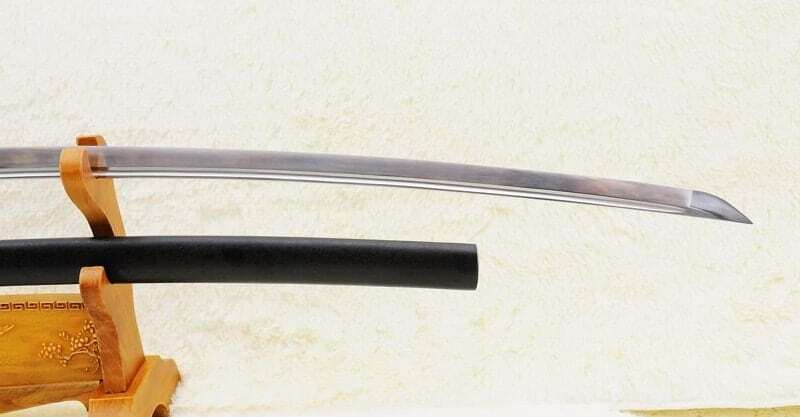 This beautiful odachi sword is made from high quality 1095 high carbon steel. We mentioned the importance of skilled craftsmanship in the buyer’s guide above; well you have it in spades here. The steel is repeatedly heat treated and hand forged so that impurities are removed before it is hammered to make the sword. 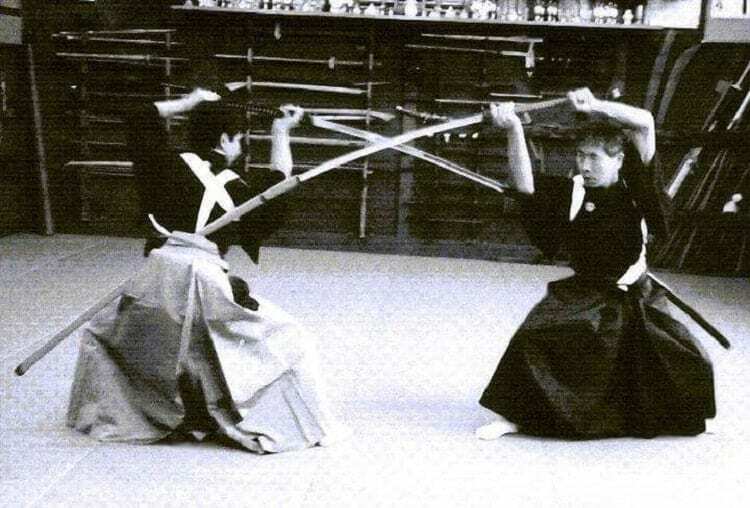 Traditional Japanese processes are followed so that the sword has a high degree of strength and flexibility. The blade is full tang of course, and in keeping with traditional Japanese motifs the sword features a hand engraved Mei (Signature). The additional extras are all top quality too. The sword comes complete with a silk sageo/ito as well a genuine same’ (rayskin). The saya is made from a distinctive black matte hardwood. A truly wonderful addition to any collection, our top choice odachi also comes hand polished by skilled craftsman. Just make sure you have that display case or wall mount ready for its arrival as you will want it on show as soon as you get your hands on it. 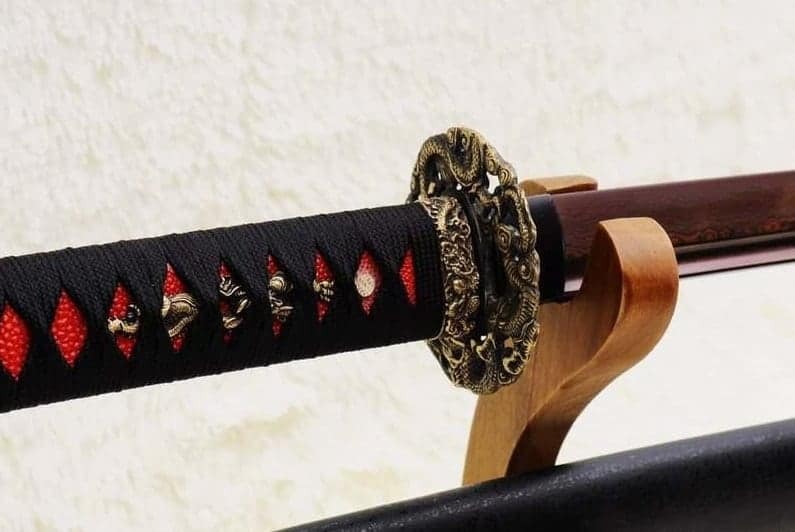 The Hand Forged Odachi 1095 High Carbon Steel Japanese Samurai Nodachi Sword gets our top pick because it does everything a quality odachi should do – formidable size, absolutely stunning to look at while being incredibly well built too. In our opinion, this is the one to buy. 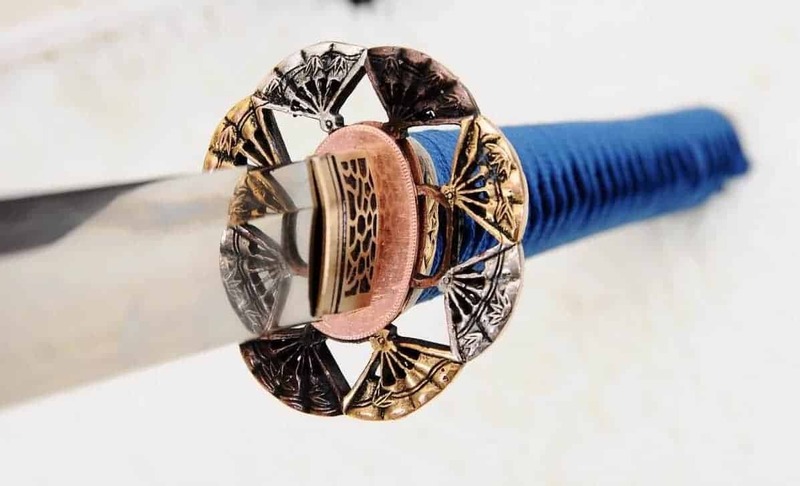 This colorful folded steel sword is made from the guys at Swords of Northshire following traditional Japanese process. Folded 13 times creates over 8,000 layers once the blade has been fully forged and hammered into shape. This results in an extremely strong sword. From an aesthetic standpoint, the black and red finish on the blade is very striking. This is done via craftsman etching an oxidation process onto the metal after sharpening. If you want to stand out at the dojo, or have something unique hanging on your wall you need look no further. The manufacturers do not hold back on the extras when you buy an odachi of this quality. It comes complete with a black matte hard wood saya as well as a silk sageo/ito. The various fittings are made from brass and genuine same (rayskin) is also provided. 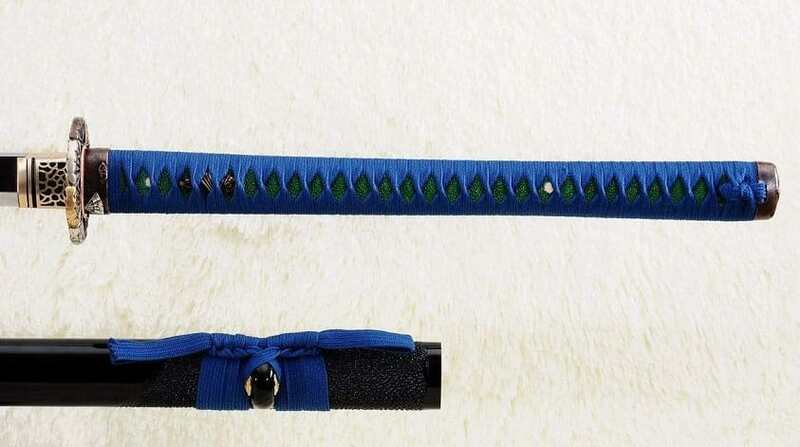 Two bamboo mekugi are used to attach the full tang blade to the handle. This Hand Forged Red and Black Folded Steel Samurai Dragon Odachi Sword really does make a statement. The black and red finish really does set it apart. If that’s the look you prefer, you may even see this as the best odachi in our top 3 review round up. For those that have the budget, the Hand Forged Nodachi Clay Tempered 1095 High Carbon Steel Odachi Tang Dao Ninja Sword is the pick of the bunch. This really is a premium odachi sword. Using traditional sword forging techniques of the Tang smiths from Japan, this sword incorporates folded steel and the use of clay for differential hardening. Each Tang Dao is forged by a master smith in Longquan. This is a region that has been connected to sword production since the heady days of the Song Dynasty. High quality 1095 high carbon steel has been selected as the material of choice. The clay tempered process not only hardens the steel, it creates an unsurpassed mirror-like finish. Exactly what a display odachi should have in other words. 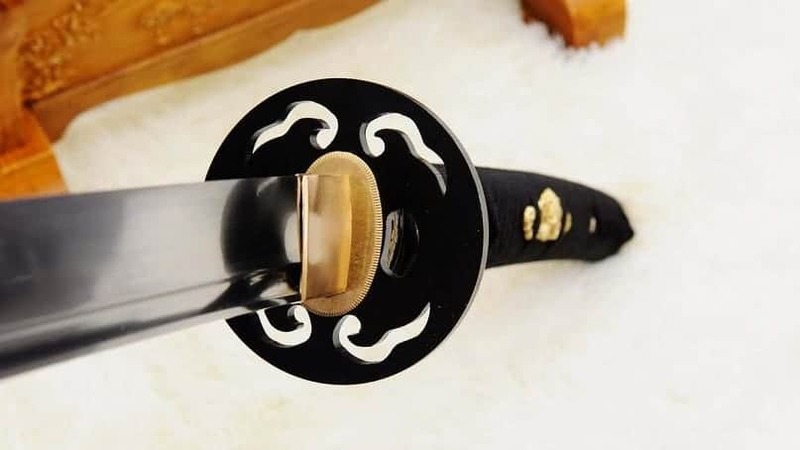 However, should you want to use this sword is a dojo setting, the manufacturers state that the steel blades are balanced in way to compliment regular Iaido & Kenjutsu use. The fixtures and fittings are what you would expect from a premium piece of craftsmanship. The sword comes equipped with a black lacqered hardwood saya with partial rayskin wrap. There is also a silk sageo/ito and genuine same’ (rayskin) and silk wrapped tsuka (handle). For those with the budget the Hand Forged Nodachi Clay Tempered 1095 High Carbon Steel Odachi Tang Dao Ninja Sword is clearly a great option. The superior forging processes and quality steel used in the build do make it the most premium odachi in our list. Highly recommended if you have the cash to spare.